Arts Alert!! 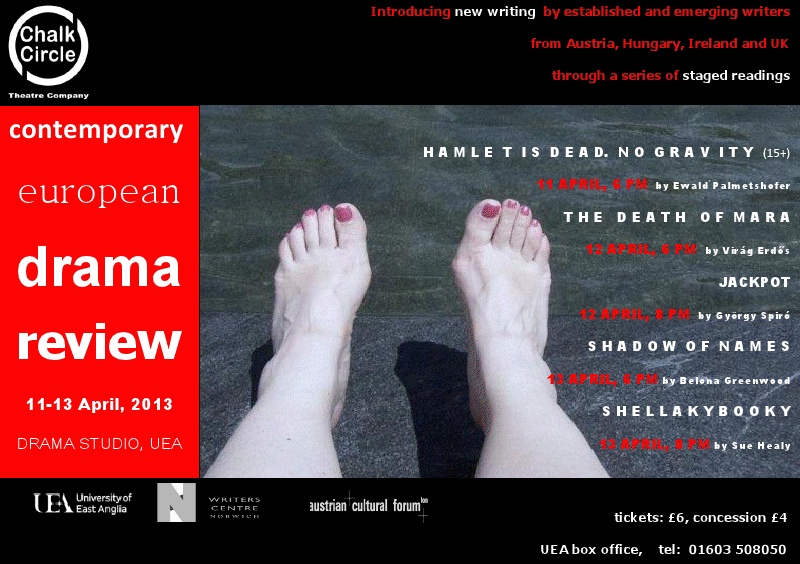 The Contemporary European Drama Review at UEA, April 11th – 13th, consists of rehearsed readings of five plays from Austria, Hungary, Ireland and the UK. My play ‘Shellakybooky’ is the final performance, 8pm Sat. 13th, April. I’m playing ‘Mar’ – the ugly sister (Hmmm, maybe I should do a re-write… ha!). Budapest, Hungary, April 2013. When Mar Roache travels from Ireland to Hungary to stay with her sister Brigette Cooney and family, she is impressed by her sister’s seemingly idyllic expat existence. Brigette simply ‘does not do negativity’ and her days are full of champagne and origami classes. All is not how it seems, however, and cracks are soon evident in the Cooney’s perfect veneer. A mistress, a graffiti-obsessed son, an anarchist and a gay minister focused on change, all combine to shake the Cooney’s world and expose its fragility as the country’s political problems arrive on their doorstep. Do come along if you’re in the Norwich area. And don’t forget, my radio play ‘Cow’ is to be broadcast on KCLR 96fm on April 1st, 11am (local Irish time). The broadcast can be accessed online via the station website. This entry was posted on Sunday, March 24th, 2013 at 16:33	and posted in Uncategorized. You can follow any responses to this entry through the RSS 2.0 feed.